. : Midriff Records Night with Eldridge Rodriguez, Lucky Dragon, M.G. Lederman and Greg Lyon | Radio | 2 Feb.
Midriff Records Night with Eldridge Rodriguez, Lucky Dragon, M.G. Lederman and Greg Lyon | Radio | 2 Feb. If there is an LVMH of Boston indie rock, then surely it is Midriff Records. The venerable label, home to indie rock luminaries including The Beatings, Age Rings and Greg Lyon, celebrates this year its 10th anniversary with a number of events, including a monthly residency at Somerville's Radio that begins tomorrow. 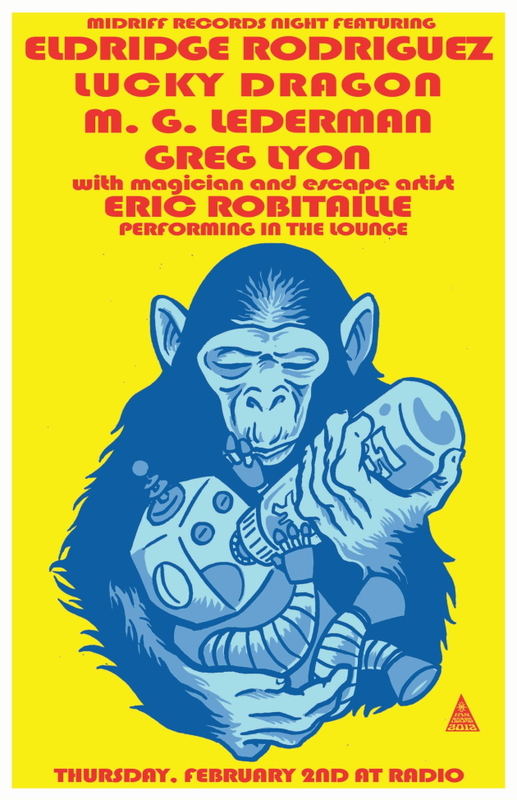 The inaugural evening features Eldridge Rodriguez, the aforementioned Mr. Lyon and new signees Lucky Dragon and M.G. Lederman onstage upstairs, while magician and escape artist Eric Robitaille will do his thing downstairs at Moe's Lounge, presumably between sets, assuming he can get himself escaped from whatever predicament he has put himself into in the span of 10 or 15 minutes or so. Otherwise it could be a long night for Mr. Robitaille. Feel the Facebook Event page vibrations right here. The next event is already on the books and transpires March 23, when The Beatings will perform its acclaimed 2002 full-length debut Italiano! in its entirety, front to back. Midriff, of course, will continue to release hot rock and roll musics this year, and already on deck is an EP from Age Rings and full-length albums from Eldridge Rodriguez, Greg Lyon, M.G. Lederman and Lucky Dragon. As far as the back catalogue goes, well get ready: March will also see a sale on older titles, discounted to move. We told you and told you to buy The Beatings' Holding On To Hand Grenades in 2006; apparently the planned sale prices will leave you with no credible excuse. Excited? You should be. Get out tomorrow night and get in on the ground floor with the thing that will be that thing that is the thing. With magic. Now listen to Greg.